How do you score nine touchdowns in a single professional football game? "First," Eddie Brown says with a laugh, "they have to throw you the ball that many times." 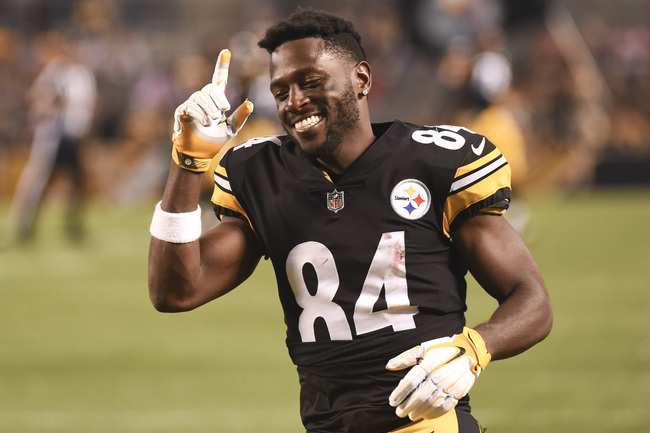 Understand this: The man best-known for being the father of Pittsburgh Steelers receiver Antonio Brown never planned on scoring 54 points all by himself, any more than he planned on becoming arguably the greatest player in Arena Football League history. The tightrope route running, the sauteed defensive backs, the gaudy numbers, the apropos nickname, the irrational excitement he still generates among football fans in upstate New York—for "Touchdown" Eddie Brown, none of those things were goals. They were merely outcomes, the result of fanatical work and meticulous preparation, of a deep desire to make the most of a second chance in a sport he once feared had cast him aside. When Brown caught seven touchdown passes and scored twice more for the Albany Firebirds in a 1996 game against the Minnesota Fighting Pike, he wasn't thinking about setting AFL single-game records for total points, receiving touchdowns and total touchdowns. He was just "doing his job." "I just figured the quicker I could score, the quicker I could sit down," Brown says. "Less wear and tear on my body." If you've ever wondered where Antonio Brown got at least some of the talent that has made him a five-time Pro Bowl selection, wonder no more. In a pass-happy league known for eye-popping offensive statistics—thanks in part to details like having a 50-yard field, eight players per side and no punting—almost no one did more scoring and sitting than Eddie Brown. When he retired in 2004 following 10 seasons in the AFL, he was the league's all-time leader in receiving touchdowns (303), receptions (949) and receiving yards (12,726) and ranked second in scoring with 2,070 points. In 2006, the AFL celebrated its 20th anniversary by selecting its top 20 players. In a vote conducted by league executives, coaches, former players and journalists, former Iowa Barnstormers quarterback Kurt Warner—perhaps you've heard of him—finished No. 12. Brown finished No. 1. "Eddie was Mr. Everything," former Firebirds defensive back Derek Stingley says. "He knew he couldn't be stopped," says Jeff Loots, who used to play quarterback for the Firebirds. "And everybody that covered him knew that he couldn't be stopped." "My running joke is that I was one of his many backups," says Jeff Foley, a former journalist who spent a season playing for the Firebirds while writing War on the Floor, a first-person account of life in the AFL. "Pretty much anybody who was a receiver in Albany was one of his backups. He was scoring six or seven touchdowns a game." Odd as it may seem now, Brown almost never got the chance. A Miami native and junior college standout who played two seasons at Louisiana Tech—where he scored 13 touchdowns total—Brown was cut by the then-Phoenix Cardinals during training camp in 1992. Worried that his football career was over, Brown returned to school to finish his degree. He also continued to work out, convinced that he had yet to realize his full potential. At night in his dorm room, he would pray for one more shot. "I told myself that if I ever got that opportunity, no one would ever outwork me," Brown says now. He waited. And waited. In the spring of 1994, his phone rang. Firebirds coach Mike Hohensee had spoken to the Cardinals' receivers coach, and he wanted to know if Brown would be interested in coming up to Albany for a tryout. Brown said yes—provided he could return to campus to take his final exams. He made the Firebirds' 20-man active roster, earning a base salary of $500 a game. "My first four games, I scored like six touchdowns," Brown recalls. "Per game. Halfway through the season, they offered me a pretty nice contract." Arena football, Brown discovered, was different. The field was smaller, the action was quicker and the margin for error was almost nonexistent. Plus, there were sideline walls. "There is no out of bounds," Brown says. "The first time you hit that wall, you have to make a decision: 'Is this what I really want to do?' I saw guys try out for our team, hit that wall, and get up and walk right out of the league. If you could get through a game without hitting it, that was a great game." As a rookie, Brown was the named the AFL's Most Valuable Player. In his career, he would also be named the league's Offensive Player of the Year in 1996 and 1999, win MVP of ArenaBowl XIII and lead the AFL in scoring five times. Still, if you'd asked quarterback Mike Pawlawski—who joined the Firebirds in 1996—figuring out why Brown was so good wasn’t as easy. Pawlawski had been a college star at Cal. He had played in the NFL and the AFL. On film, he says, Brown looked "slow in his routes." "I thought, 'Man, how is this dude getting open?'" Pawlawski says. "And then I came in and saw him operate." Brown was the AFL's version of Jerry Rice. Like the Hall of Fame NFL receiver, he wasn't particularly fast. Nor was Brown a physical specimen, standing 5'11" and weighing 192 pounds. In his book, Foley writes that Brown looked like "he could still be a high school flanker." But Brown's route running was patient and precise. His football IQ was off the charts. He took full advantage of arena football's quirks, like a scarcity of double coverage and motion rules allowing one receiver to move forward before the snap. "He utilized every bit of talent that he had," Pawlawski says. "He would set defenders up so bad, just spin them. Once that ball was in the air, nobody was going to outdo him. His focus was incredible, and he had the strongest hands of any receiver I've ever seen." Brown says his secret was simple: "preparation." He always practiced in full pads, even when his teammates wore shoulder pads and shorts. He took every rep with Albany's first and second teams. He was the first player on the field and the last to leave. While Firebirds coaches usually distributed their game plan for upcoming opponents on Tuesdays, Brown would spend Mondays "calling them at least 10 times," nagging them for an early copy. "He was a workaholic," says Stingley, who had to cover Brown in practice. "His energy was just unbelievable." One year, Stingley joined Brown for an offseason workout at a small college in Albany. Brown placed four cones on the field. The two men ran. And ran. And ran some more. "Thank God," Stingley remembers thinking as he gasped for air. "This has to be the point where we take a break." "That's the warm-up," he said. "Those four little cones killed me," Stingley says. "I was throwing up. I thought I was in shape, and I couldn't finish." Through Brown freely admits that being cut by the Cardinals drove him, he never again tried to make the NFL. He didn't need to. At the time, AFL stars were earning six-figure salaries, and the league as a whole was booming. Teams regularly drew crowds of 10,000 or more. Games were being shown on national television. The on-field talent level was high, a mix of former college stars and players with NFL experience. In 2000, Midway even released a PlayStation game called Kurt Warner's Arena Football Unleashed. Brown was beloved in Albany, and so were his teammates. "It was probably the best Arena League community in America," Brown says. "They would have a block party before our games with people tailgating, and it was an all-day-type deal, just like an NFL game. The city didn't have any professional sports besides hockey. We were their baby." While playing for the Firebirds in Albany and Indianapolis—the team moved in 2000—Brown coached high school football and has continued to do so following his retirement. Now 48, he lives in the Miami area and has mended a once-estranged relationship with his son Antonio, who briefly lived with him in Albany but largely grew up with his mother, Adrianne, in Miami. The father-son rapprochement began when Antonio was playing at Central Michigan and Eddie was coaching an arena team in Fort Wayne, Indiana. By the time Antonio became an NFL star, he was calling his father after games, asking for critiques of his route running. "I had to do my homework!" Eddie says. "He doesn't [call for advice] much anymore. He doesn't need it. He's the best. But I still watch all his games. "In fact, I was just watching him run a drag route against Cincinnati. He didn't take the right angle, and when the ball came, all the DB had to do was reach over and knock—"
"I still don't know how to turn that off," he says. "And you know what's scary? [Antonio's] perfectionist streak is at a higher level." To wit: The last time Eddie visited Antonio at his Pittsburgh home, he saw a large calendar on the wall of an upstairs room. In the box for each month on the calendar, his son had written down his goals for that period of time. "OK, so what happens if you don't accomplish that?" Eddie asked. Antonio gave him a look. "If that look had been bullets, I think I would have been shot dead," Eddie says. "He said, 'Dad, if I put it on that board, then it has to get done.'" Eddie took a second look at the wall and realized something—the calendar was for the next two years. Like father, like son. And then some. "I was like, 'Oh my God,'" he says. "I would have planned, but not that detailed."